Known as the convenient and friendly place to get new, used, rental, or e- textbooks, online or in the store, The College Store is also a retail destination for the greater Potsdam community. Located in the Barrington Student Union, the store offers a variety of merchandise and a wide array of school supplies. 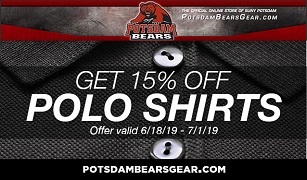 Always in stock are SUNY Potsdam and Potsdam branded clothing and accessories, ball caps, athletic wear, mugs, glasses and gift items. The store has the most complete line of SUNY memorabilia and alumni related material. The store sells the latest hardcover and paperback books. Find unique gift items, such as Vera Bradley, Candles and Plush animals. Your on and off campus needs can be met from a diverse selection of school, art, and office supplies stocked at the store. We also sell computers and computer products, including software available at educational prices. Check out the Bear Care program, providing friends and relatives of students the opportunity to send gift baskets, care packages and surprises to students for any occasion. As with all of PACES operations, net revenue from sales is used to improve operations given to the college to support student scholarships and programs.